GearGems.com » No Quiero Pachelbel! Pachelbel’s Canon – you either love it or hate it! This design is obviously for jaded musicians who fall into the “hate it” category! Featuring an angst-exuding, tongue-extending, piddling Chihuahua within the caption “No Quiero Pachelbel!”, there’s no need to be Mexican to appreciate this – if you play violin, viola or (shudder) cello, especially in a string quartet and for frequent wedding ceremony gigs, you can certainly identify with this sentiment! Also check out this humorous “String Quartet Definition” design! 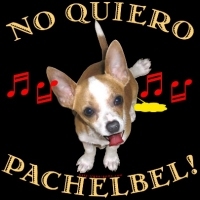 Purchase the cute “No Quiero Pachelbel” design now on various apparel and giftware items for your favorite wedding music performer!